Textured Silver 950 Hill Tribe Concave Cuff Bracelet, "Karen Silver Elegance"
Elegant and beautiful, this design is presented by Achara. 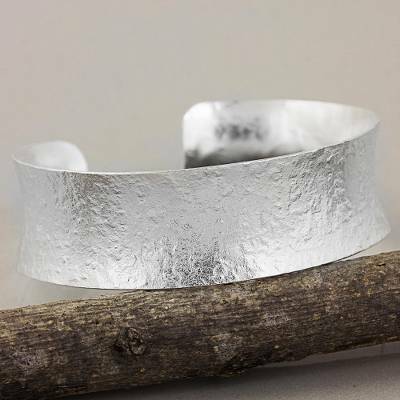 The cuff bracelet is handcrafted from silver 950 with intriguing textures by Thailand's Karen hill tribe artisans. You can find silver cuff bracelet 'Karen Silver Elegance' by Achara in jewelry categories such as Hill Tribe Bracelets, No Stone Bracelets, Silver Bracelets, Fine Silver Bracelets and Cuff Bracelets. Enjoy exploring these sections for other Novica treasures. Masterfully made, this jewelry piece is gorgeous in its simplicity. A beautiful artistic creation. Highly recommended.Thank you Novica and Mrs.Achara for having made it possible for the Hilltribe people to share their knowledge and their artistry.